Are you building a home in the Jacksonville area? If so, you’re probably busy making a lot of decisions about what features to include in your new home. Will the counter tops be granite or laminate? Will the bathroom shower have glass doors or just a curtain rod? Will the lighting be controlled by switches or dimmers? While you’re contemplating all of these important features inside your home, don’t forget that there are outdoor features to be included as well. Most importantly, will there be an irrigation and sprinkler system at your new Jacksonville home? 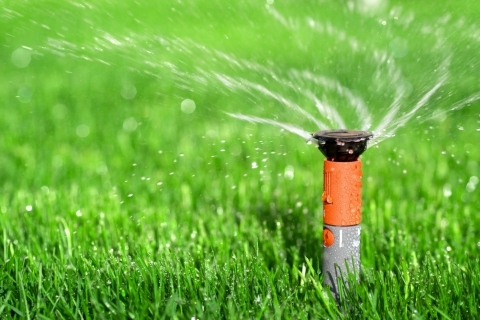 Even though there might not even be grass planted outside your in-progress home, now is the time to think about irrigation and sprinkler systems. Why? Because irrigation and sprinkler systems have to be installed below the surface of your turf. If your grass hasn’t been planted yet, it’s the perfect time to bury a sprinkler system beneath the soil. What Are The Benefits Of Irrigation And Sprinkler Systems In Jacksonville? Set It And Forget It – One of the biggest advantages of having an irrigation and sprinkler system in Jacksonville is that you’ll never have to worry about watering your lawn again. Set your sprinkler system in the spring and forget it until it’s time to winterize it in the fall. Water More Efficiently – Watering with a manual sprinkler is inefficient because it can never reach all portions of your lawn. Even if you move it all around, there’s bound to be a section that’s missed. With irrigation and sprinkler systems, heads are placed strategically in all corners of your yard so that the entire property is evenly watered. Added Home Value – Both of the reasons above mean that Jacksonville homes with irrigation and sprinkler systems installed are likely to fetch a higher value on the market. If you think you might re-sell your home someday, this is very important! C & L Landscape is your trusted provider of irrigation and sprinkler system installation in Jacksonville. Contact us for a FREE consultation today!